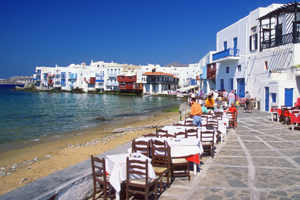 - Given the crisis, are you experiencing much interest in Greece at the moment? We had a couple of months where we weren't getting any requests but it's all coming back, particularly with the special deals being offered by hotels. Last year the whole market had to discount itself, so in general Greece is about 25-30 per cent cheaper than before. - Which areas are getting the most interest? We're receiving a lot of queries for the islands - Crete and Rhodes are the biggest attractions, as well as Santorini, Kos and Mykonos. No matter what happens, the Greek islands will always be the top destination in the Mediterranean. I think a wise buyer will see this year as an opportunity. - Is there a worry that the standard of the product will have dropped, along with the cost? The quality remains exactly the same. In fact, people are trying to do their utmost to change the damage to Greece's image, so service is in many ways actually better than before. It's the only way of advertising what they can do, because promotional budgets have been cut.